Nearly 50% of people who have rosacea also have a condition known as small intestine bacterial overgrowth, or SIBO. In one small study, 100% of people who have ocular rosacea (which can cause red and puffy eyelids, a feeling of grittiness in the eyes, eye pain, and sensitivity to light) have the predisposing condition. About half of the people who have rosacea, also have a condition known as small intestine bacterial overgrowth, or SIBO. Bacteria overgrowth is a condition that occurs when a surface inside the body that normally hosts only a small number of bacteria becomes covered with a film of non-disease causing bacteria or when it is overtaken by pathogenic microorganisms. The small intestine was once thought to be a nearly sterile environment. Since the small intestine is just below the stomach, scientists reasoned that most of the bacteria and other microbes in food and drink were probably killed as they passed through stomach acid. Now scientists know that many strains of bacteria are present in this uppermost part of the lower digestive tract even at birth. Relatively harmless strep bacteria and symbiotic Lactobacillus bacteria exist in small numbers in the small intestine. A milliliter (1/5 of a teaspoon) of fluid in the small intestine usually contains about 10,000 bacteria. That compares to 100,000,000,000 bacteria in a single milliliter of fluid in the colon. When the bacteria count in the small intestine climbs from 10,000 to 100,000,000,000 bacteria per milliliter, a condition of overgrowth is said to exist. This can occur when the stomach fails to secrete enough acid, or when the peristaltic action that propels digested food through the intestines becomes sluggish, when the pH of digested food becomes less acidic (acidity being a good thing in this case), or when excesses of certain minerals in the diet trigger sudden growth of disease-causing bacteria. It can occur when the ileocecal valve between the small intestine and the colon fails to keep colon bacteria from migrating up into the small bowel, or when pouches form in the lining of the small intestine in which bacteria can grow. Bacterial overgrowth often causes diarrhea, because the slimy film of bacteria coating the small intestine interferes with the absorption of fat. Unabsorbed fat causes especially smelly diarrhea with stools that float. There may be abdominal pain, bloating, and flatulence, as well as deficiency symptoms caused by the inability to absorb fat-soluble vitamins such as A and K as well as the inability to absorb calcium. There can be skin irritation and brittle nails because of selenium deficiency. But SIBO can also aggravate acne. Bacterial overgrowth in the small intestine, it turns out, can also increase the severity and frequency of rosacea outbreaks on the face. About 40 years ago a team of pathologists at the Royal Victoria Infirmary at Newcastle on Tyne in England performed a series of autopsies on rosacea patients who had willed their bodies to science. They found that about 1 in 3 of these patients had “multiple convolutions” in the lining of the small intestine. These tiny pouches form a home in which bacteria can grow. The bacteria then, the researchers reasoned, emit some kind of toxin that gets carried to the bloodstream that causes rosacea to break out. Later researchers theorized that perhaps these tiny pouches are caused by celiac disease that is not severe enough to cause full-blown symptoms. Celiac disease is a sensitivity to gluten, more specifically to a component of gluten called gliadin, that is found in wheat, barley, rye, and oats. In clinically diagnosed cases, it causes severe damage to the lining of the small intestine that results in obvious symptoms. It may be that in milder cases it just stimulates the growth of the lining of the small intestine so that bacteria can accumulate. 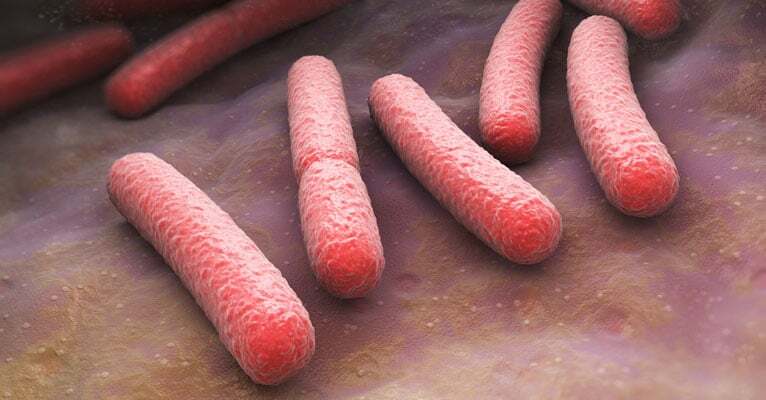 These bacteria reach the small intestine when there isn’t enough acid in stomach, perhaps after taking an antacid or a medication for gastroesophageal reflux disease. Or maybe severe constipation causes them to accumulate. There would have to be a combination of mild celiac disease plus something that transports bacteria to the small bowel for rosacea flares to occur. And it’s all just a good theory. Scientists don’t know for sure that wheat sensitivity usually causes rosacea. Only about 35% of people who had rosacea had obvious changes in the small intestine. It’s not necessary to snip a piece of small bowel and look at it under a microscope, however, to diagnose small intestine bacterial overgrowth (SIBO). Nowadays, that can also be done with a breath test. In 2008, Italian researchers recruited rosacea patients whose breath tests indicated that they had SIBO and gave them antibiotics to kill the excess growth of bacteria in the small intestine. The researchers were astounded by the results. In 70% of patients who had both rosacea and SIBO, treating the overgrowth eliminated rosacea outbreaks. In the other 30%, symptoms were greatly improved. One round of antibiotics for the bowel—not for the skin—eliminated rosacea on average for nine months. These results don’t suggest that absolutely everyone who has rosacea would benefit from antibiotic treatment, since not everyone who has rosacea has SIBO. If you do have both rosacea and SIBO, however, medically directed antibiotic treatment may make a huge difference in the severity of rosacea. These results also don’t suggest that everyone who has rosacea needs to go on a wheat-free diet. Sometimes it may help. But controlling the overgrowth of bacteria is what resulted in controlling rosacea, not eliminating wheat-flour bread and pasta from the Italian diet. It’s also important to remember that the antibiotics that cured rosacea were not used to treat acne bacteria. Rosacea usually does not involve bacterial infection of the skin. Rosacea occurs when small blood vessels beneath the skin are inflamed and break, leaking blood beneath the skin. But a rosacea treatment that is this simple and this expensive is definitely worth discussing with your dermatologist. Ask if there is a possibility you might have SIBO and whether antibiotics might be appropriate for you. There is no cure for Rosacea. Flare ups can be caused by certain foods eaten...such as drinking hot beverages or spicy foods. Nothing "gut" related to rosacea. More severe rosacea can be treated by a dermatologist.